I don’t know where the time is going but these days it seems to be travelling at mach speed. Somehow my precious little baby boy has morphed into an intelligent, independent little toddler, seemingly overnight. For the past few months, Tristan has been enjoying mama’s milk once a day before his nap. As I fretted over whether or not I should wean him, he slowly started doing so himself, cutting out a day here and there. After learning so much about the value of breastmilk, I finally made the decision to let him self wean, on his own schedule. As soon as I made that decision, Tristan apparently made his, and slowly but surely he went from nursing once a day, to once every couple days, and has not now had any in the last two weeks. I guess he’s done, and it feels right because we were both ready. In the couple of weeks leading up to his weaning, I knew it was coming and desperately wanted a photograph to remember this period in our lives. I haven’t had one taken of Tristan and I nursing since he was an infant. One weekend afternoon, I called Luc upstairs as I was putting Tristan down for his nap and asked him to bring his camera. He spent ten minutes taking pictures from various angles, getting artistic with his shots. I came down stairs afterwards and Luc said, “I got some really great shots!” I excitedly picked up the camera to have a look only to find that THERE WAS NO MEMORY CARD IN THE FREAKIN’ CAMERA! Of all those shots Luc had proudly taken, not one of them was actually captured. I came downstairs and cried. I cried not because he was no longer interested in mama’s milk, but because I didn’t get that darn picture. The next day, Tristan asked for milk for the last time. Luckily for me, Luc was home and I called him up right away. I didn’t get the passionate photography session I got the first time around… but I did get my one picture. Now I can happily store the mammaries away for baby #2, feeling very confident that I did the very best I could for my little boy. Around the same time that Tristan decided that he didn’t need mama’s milk anymore, his big boy bed arrived. I had nightmarish visions of my super sleeper returning to the routine of getting up several times a night, unsure about his new sleeping arrangement. Happily, I could not have been more wrong. 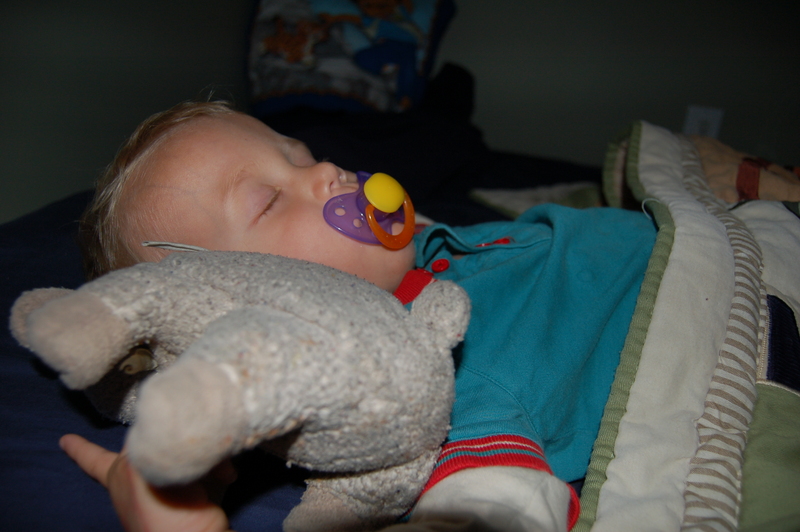 Every day at nap and bed time, Tristan excitedly heads for his “big boy bed”, jumps right in, and goes to sleep! I couldn’t have dreamed of a smoother transition. You are currently browsing the A Mom Like Me blog archives for June, 2010.